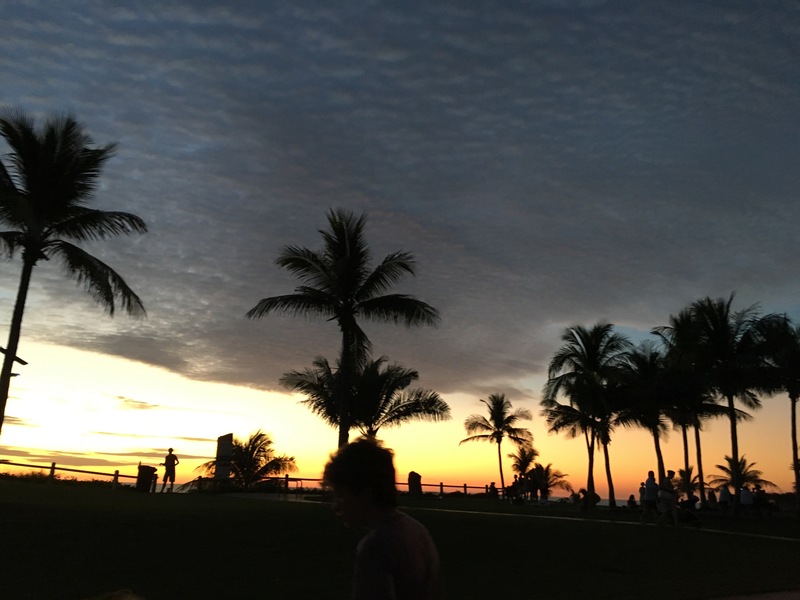 We arrived in Broome in the late afternoon and set up our van next to the pool at Cable Beach Resort before heading straight down to the town beach for their Thursday night markets. 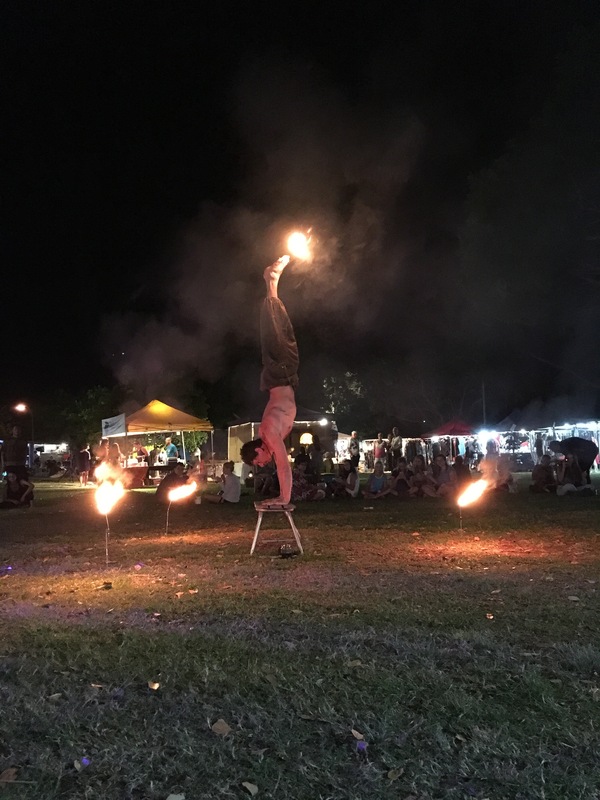 It felt a little like being at the Mindil Beach markets in Darwin – the warm and balmy evening, cultural food trucks scattered around the place, hippies and kids in tie dyed clothes dancing to the sounds of folk singers playing live and lots of jewellery stalls. We plonked on the grass for some dinner and wondered around the markets until closing time at 9pm – by then we were ready for bed. After a bit of a sleep in the next morning, we headed to town for groceries and to go to the visitor centre. A friend from work arrived in Broome that morning and met us at the visitor centre to join us for the day. 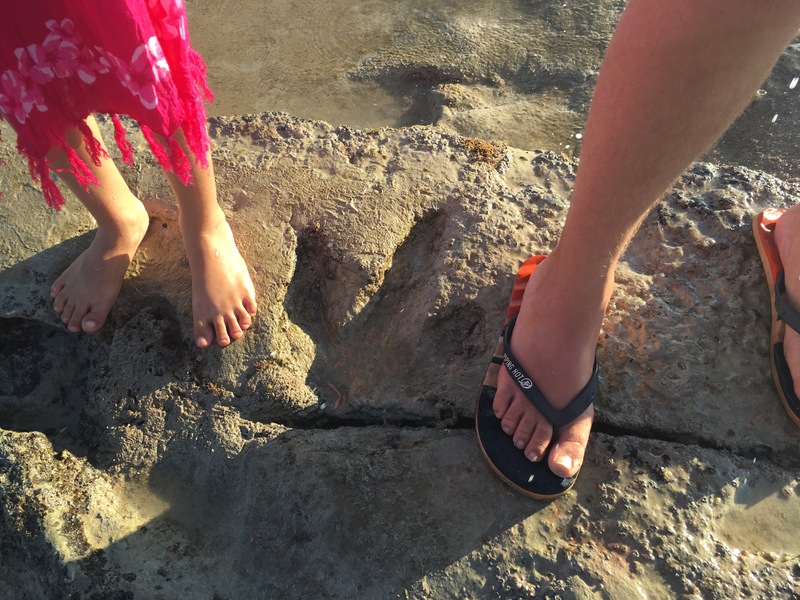 Our plans to check out dinosaur footprints had to be put off for a few days until the tide was out so we ended up going to the museum which was very interesting and the kids got to do an activity sheet as we wondered around. 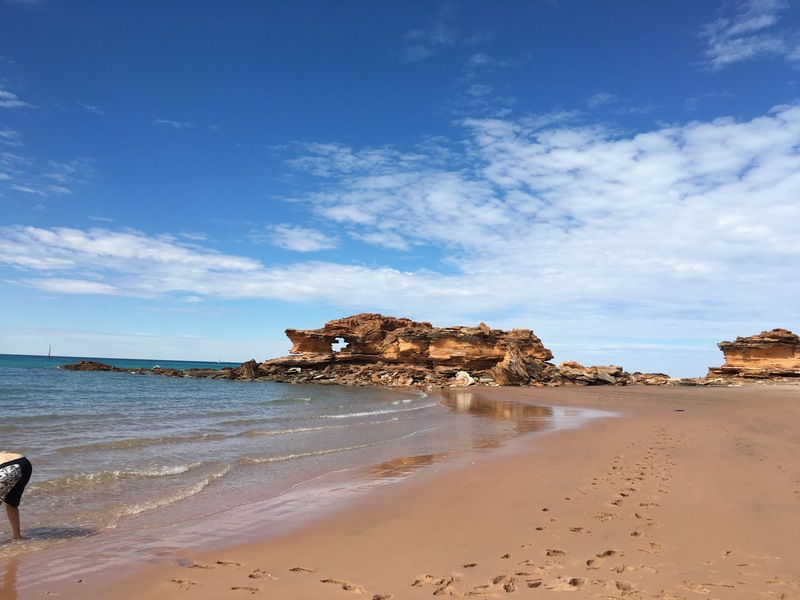 Broome is yet another town that was directly involved in the war with an air raid on the town – I’d only ever really known about Darwin’s war history and had no idea other towns had been so directly affected. I still had to grocery shop and remembered that we had to vote tomorrow but we’d be off doing tourist stuff so I found a polling booth and voted early (I didn’t really think about these sorts of official duties that I’d still need to undertake while travelling). 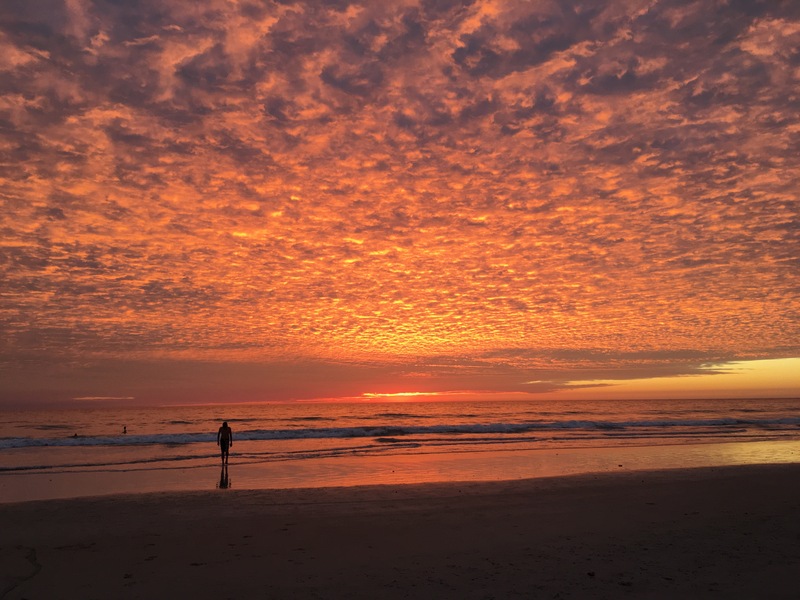 With the chores out of the way we headed to Cable Beach to enjoy the remnants of the sunset and splash our feet through the warm shallow waters. While there we noticed orange signs with a croc head on them – we figured this was a warning that crocs lived in the northern end of WA but that we were in a safe spot for swimming. Once it was dark we headed off to Divers Tavern for some dinner and a cold beer beneath one of the biggest TV screens I’ve ever seen – it seemed almost as big as the scoreboard screen at the MCG! The next morning we thought we’d head out to Malcolm Douglas’ Wilderness Park but it doesn’t open until 2pm so back to town where we drove to Port and despite the jetty being closed for repairs, we ended up spending a few hours meandering along the beach collecting shells and admiring the crab and bird life. It was the weekend so we headed to the markets to check out some of the stalls – many were the same as Thursday night with a few different ones and a yummy mango smoothie van that we had to visit. 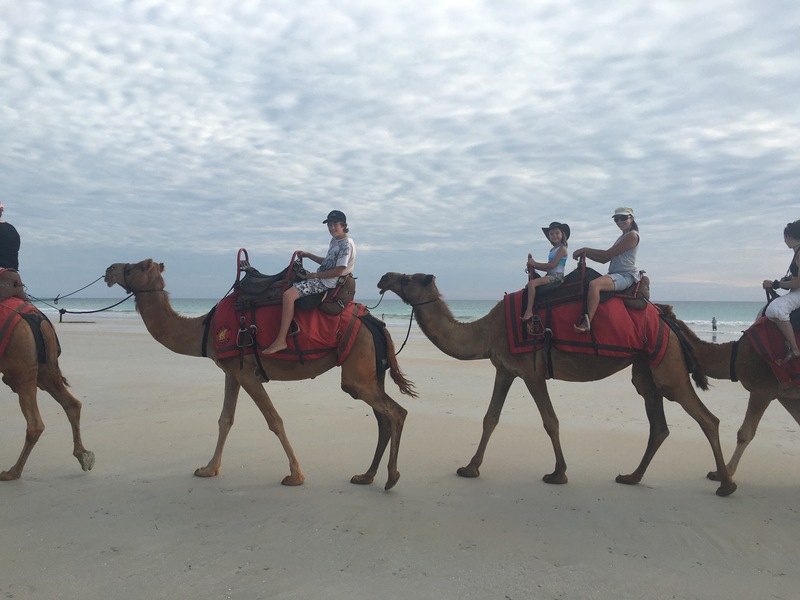 We dropped my workmate off for her big nine day tour and headed to Cable Beach for our pre-sunset camel trek. 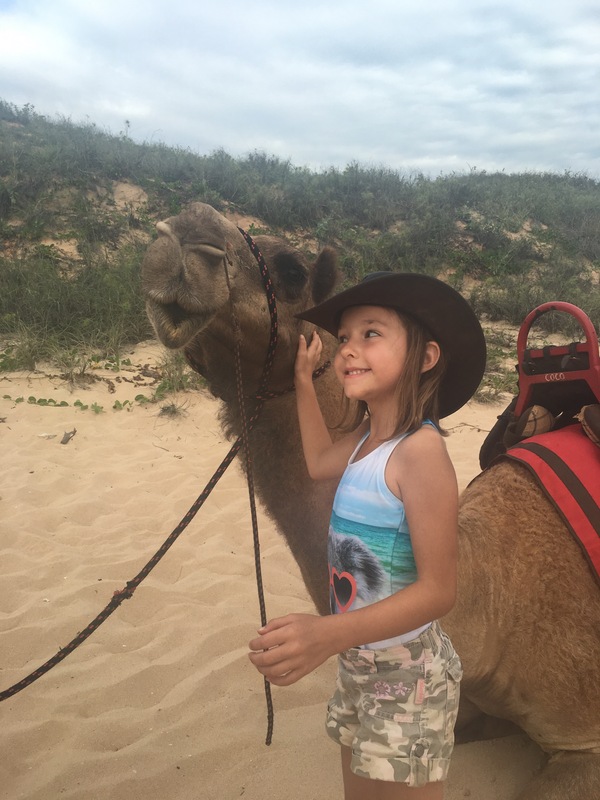 Miss6 and I were on Cocoa – possibly the worlds tallest single hump female camel, and Master14 was on Jerry – named after Jerry Hall for her long legs. The ride took us along the northern end of the beach along the shoreline where there were cars parked on the beach. After the camel ride we decided to get the car and drive down onto the beach for sunset. 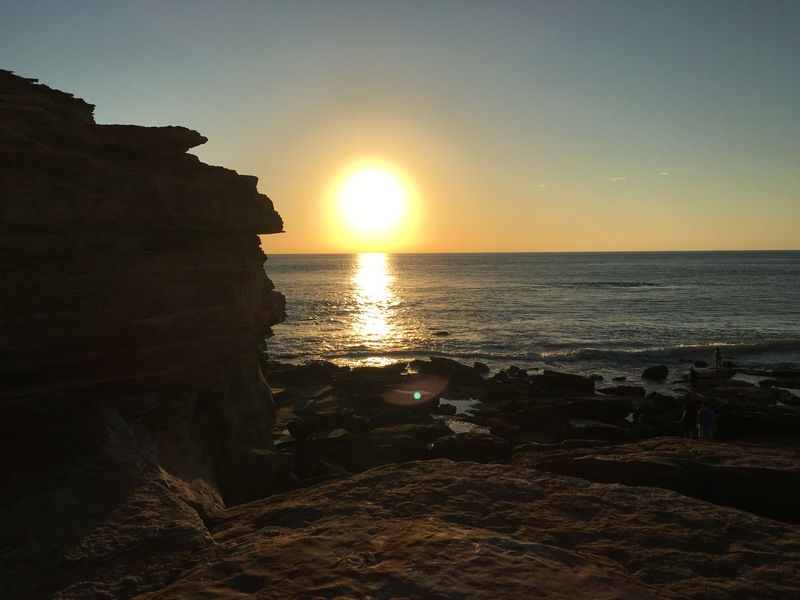 It was so convenient having the camp chairs in the boot – we relaxed on those between having a swim and a kick of the footy on the sand and watching the sunset. Sunset here is one of the best I’ve seen and can certainly understand what all of the fuss is about. 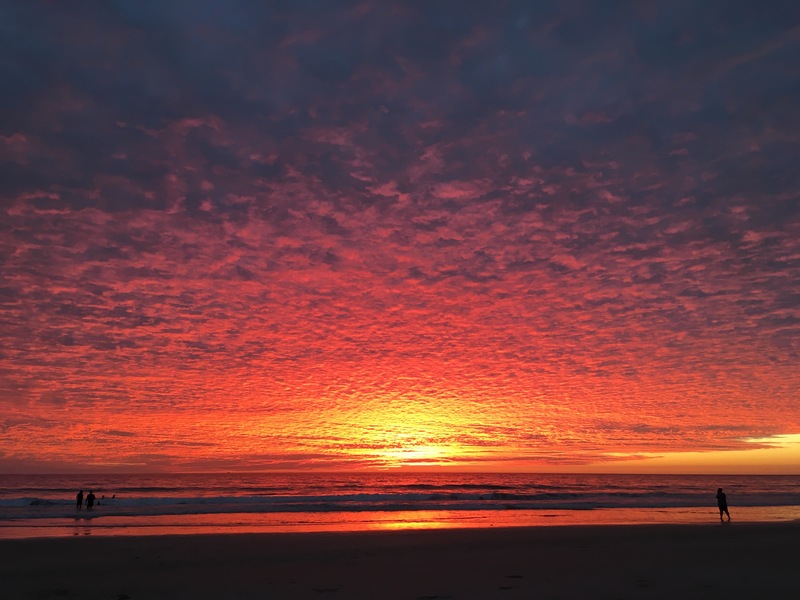 These pics were all taken at the same sunset – the colour changes are amazing. We tried to sleep in the next day but Miss6 was in terrible pain and I had to take her to the hospital where, after a few hours, we had some antibiotic cream for a skin infection (we joked that she just wanted to join the ‘been to hospital on the big trip’ club!). 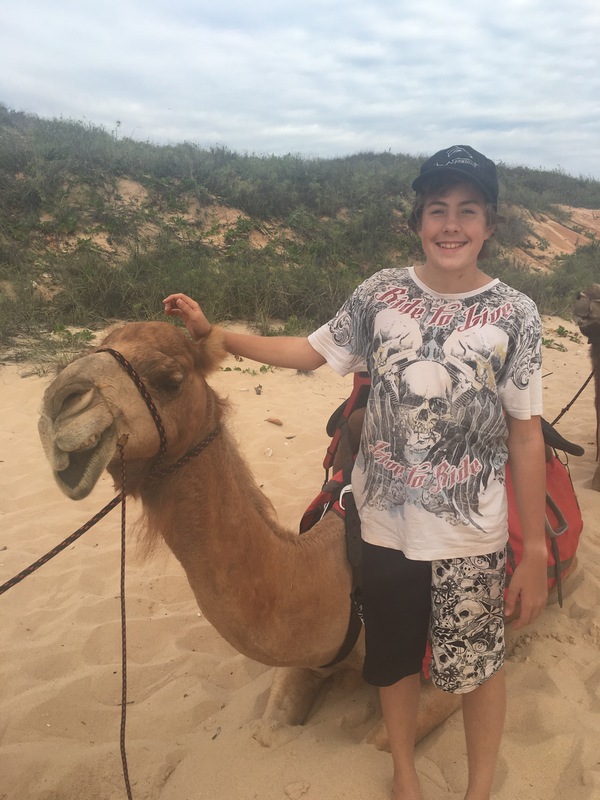 After lunch we headed to Cable Beach again for some chill time before we drove to Gantheaume Point to hunt for dinosaur footprints. We managed to find the first two prints but, like nearly everyone else there, wondered aimlessly around for ages trying to find the third set of prints. It wasn’t until we got back to the carpark that we realised that there were actually around nine different types of prints found in the area and we had probably been walking over heaps of them without even knowing. 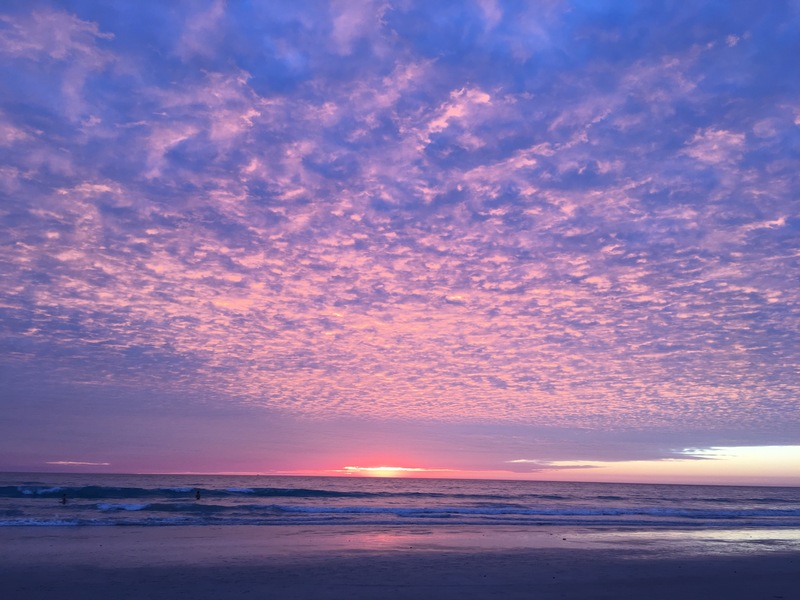 The sun was setting as we were leaving and the views from the point were almost as pretty as those we’d admired at Cable Beach – Broome certainly puts on a show at sunset. We were leaving in the morning so I asked the kids if I could stop in at Matso’s Brewery on the way home to try their chilli beer I’d been told about. We decided to stay for dinner while we were there and I ended up trying the chilli beer and the mango beer – both were delicious and so were the meals. It’ll be hard to leave in the morning but we know we’re coming back in a few days and can catch another two days here before heading south.